Successful reperfusion results in rapid and marked normalization (return) of ST-segment elevations. If the reperfusion is complete (after a total occlusion) the ST-segment is normalized within one hour, and this confirms that the coronary artery flow is patent. The rapid ST-segment return is explained by rapid normalization of myocardial cell membrane potentials in the ischemic area. 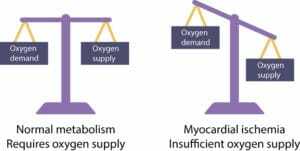 Myocardial cells are capable of normalizing their membrane potentials immediately as oxygen becomes available. Recall that ST-segment elevations also become normalized as a part of the natural course of myocardial infarction (refer to Figure 2 below). However, that type of normalization is much slower and it is explained by the gradual death (and thus disappearance of membrane potential) in the ischemic area. ECG is a better marker of reperfusion that angiography itself. Studies have shown that angiographic blood flow does not always correlate with myocardial perfusion on the microvascular level. This presumably explained by distal microembolization and dysfunctional microcirculation. Indeed, studies show that 15–35% of patients with STE-ACS/STEMI have inadequate microvascular flow despite patent epicardial blood flow. In such cases, the ECG will be more sensitive (and show a lesser amount of normalization) than evident from angiography. Thus, the ECG is the preferred method of quantifying microvascular blood flow in the myocardium, simply because ST-T changes directly reflect myocardial perfusion. ST-segment return is particularly important to assess in patients treated with thrombolysis, because reperfusion may be inadequate and/or transient with thrombolysis therapy (PCI is superior to thrombolysis also in this aspect). Guidelines recommend that thrombolysis should result in 50% ST-segment return (i.e reduction of the ST-segment elevation by 50%) within 60 minutes after administration of thrombolysis. Otherwise, one must consider rescue-PCI. For the purpose of assessing ST-segment return, one should preferably use continuous ST-segment monitoring. 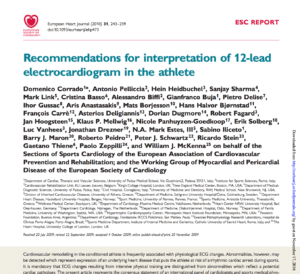 If monitoring equipment is not available, 12-lead ECGs should be repeated every 5–10 minutes, while observing the patient’s symptoms. ST-segment return is quantified in the leads with the highest ST-segment elevation. Figure 2. 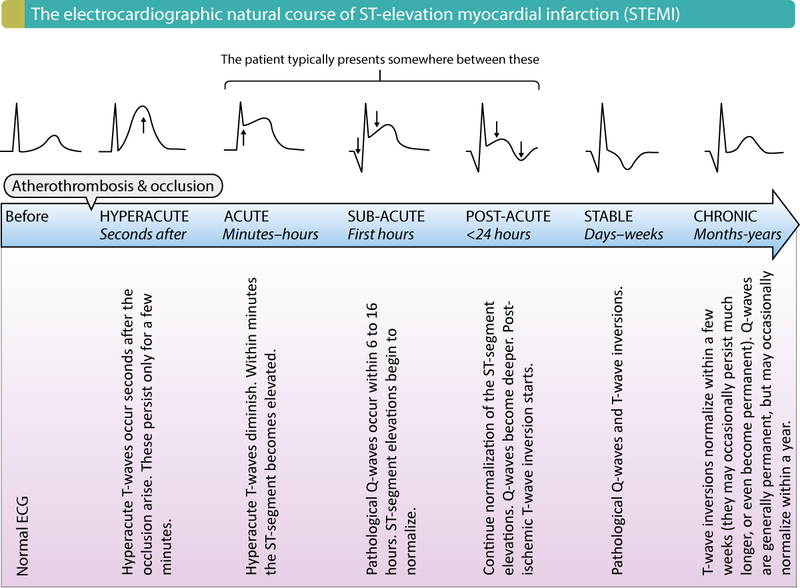 The electrocardiographic natural course in STEMI (ST elevation myocardial infarction). The slow natural normalization of ST-segment elevation (in untreated patients) is depicted in Figure 2. As evident, such ST-segment elevations are succeeded by gradual inversion of the T-waves. These T-waves are called post-ischemic T-waves and they indicate that the infarction process is more or less completed. Post-ischemic T-wave inversions emerge at earliest 4–6 hours after an episode of ischemia/infarction, but no later than 24 hours. However, T-wave inversions following reperfusion develop within 4 hours and such T-waves are robust indicators of successful reperfusion (patent artery). This is also associated with better prognosis, return of R-wave amplitudes and improved left ventricular function. This rhythm has been discussed previously in this article. Briefly, accelerated ventricular rhythm (also called idioventricular rhythm) is a benign ventricular rhythm with heart rate 60–100 beats per minute (faster than ventricular rhythm, but slower than ventricular tachycardia). Idioventricular rhythm is seen in 15–50% of patients undergoing reperfusion and it indicates that reperfusion has been successful and the artery is patent. This arrhythmia rarely causes hemodynamic effects and terminates spontaneously after a few minutes. No studies have found an association between this rhythm and survival.